Landing pages can be utilized for PPC, content marketing, SEO, social media and CRO. 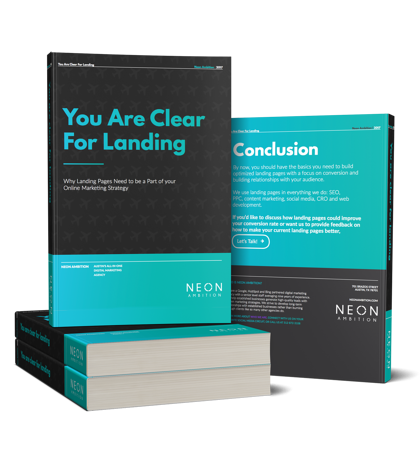 You Are Clear for Landing is the ultimate guide to landing pages. It gives you everything you need to build optimized landing pages with a focus on conversion and building relationships with your audience. Attract and hold the short online attention span of your audience. Simplify the steps needed for your visitors to understand, consider and convert on your offer. Supply relief for a pain point that your target audience is currently experiencing. Consider all the perspectives from which your audience will be reviewing your landing page. Clarify messaging to focus only on why new prospects should gain access to your offer. Ask for your visitors’ information with a give-and-take proposition. Start Using Landing Pages the Right Way! We'll show you how to resonate with your buyer personas and the traffic source from which they will arrive. What is said drives what is seen. We'll break down each element of your content hierarchy and show how to represent it in design. We'll explain the trade-off between lead quantity and quality, and showcase how to gather more intelligence.